Medical care in Japan has countless features not found in other countries. 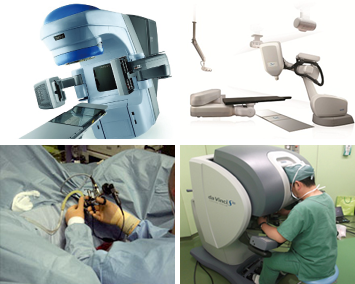 As exemplified by the words "Made in Japan", we offer a high-level medical environment backed by advanced, cutting-edge technologies. But more than anything else, we're proud that much of our medical care emphasizes a low level of invasiveness, minimizing the effects on the patient's body. Japan's medical care is aimed at providing patients with high-level quality of life following treatment. For instance, surgery to treat digestive diseases, using endoscopy, involves an extremely small incision, so patients have less pain afterwards and can recover quickly. Vascular treatment using a catheter, brain and heart surgery, and radiation therapies using the Cyber Knife and ion beam radiation, are all minimally invasive and are performed on a daily basis. 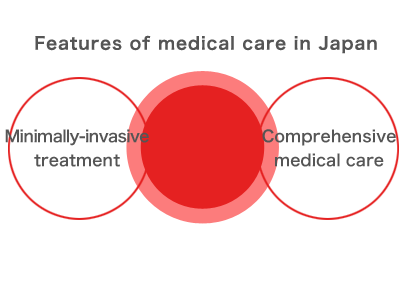 The features of Japan's medical care go beyond its cutting-edge medical equipment and outstanding technology. An important factor is our commitment to comprehensive care, encompassing all aspects from preventive care to rehabilitation. Under Japan's national health insurance program, patients have access to regular health checkups, allowing early detection of disease. Medical care extends from prevention through recovery of function after surgery as a single, continuous flow. Physicians, nurses, physical therapists, pharmacists and nutritionists work together as a multi-disciplinary team, supporting this concept of comprehensive care. Japan's comprehensive medical care is supported by high-quality treatment technology and by the hospitality of Japan's medical personnel, who work together to reach their objectives. Copyright (c) 2013 I-Cell Networks. All Rights Reserved.